An internship is more than a part-time job for volunteer position, but rather a short-term, hands-on, supervised work experience with a professional organization that is designed to increase a student’s knowledge of a professional career field through significant learning objectives. At the School of Sustainability, the internship is combined with academic coursework that encourages critical reflection on the internship experience. The School of Sustainability screens each internship carefully to monitor for a rich experience that directly focuses on an area of sustainability. Apply the knowledge and skills learned in the academic program to a professional environment. Build communication, teamwork, problem-solving, leadership and other transferable skills necessary for a successful career in sustainability. Gain information to assist in determining a post-graduation career path. Help facilitate the transition from the role of student to the role of professional. All School of Sustainability undergraduates are required to complete at least one credit-bearing internship prior to graduation (Capstone Internship), though students are encouraged to do as many internships as they can over the course of their undergraduate career. 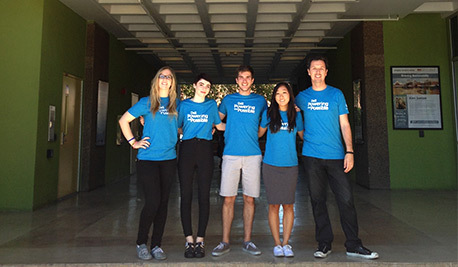 What do sustainability internships look like? 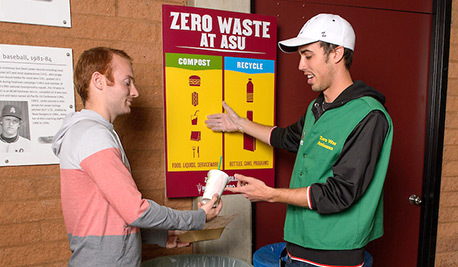 Sustainability is an inter-disciplinary area of study, and there are a wide variety of opportunities in industries including the public and private sectors, non-profits, education, and environmental. Read the Internship Handbook. Review internships on SustainabilityConnect and other resources. Think about what kinds of internships you are most interested in (at least 3 months prior to start of semester). Update your resume and cover letter. Make sure these documents are in a professional format and content is both current and relevant for each internship you are applying for. For resume review, send materials to the SOS Internship Coordinator and/or utilize ASU Career Services Resume Dropbox resource. Start applying for internships. Plan/expect to apply for multiple internships. If internship is not already approved via SustainabilityConnect, send job description to Internship Coordinator for review and approval. Work directly with internship provider on application and interview process. Make sure to adequately prepare for interview (thoroughly research organization, be prepared to talk about your experience and why you are a good fit for the position). Expect a formal interview. Repeat steps 1-4 as needed until internship is secured. Accept desired internship and notify SOS Internship Coordinator. Complete required registration paperwork with internship supervisor. Submit paperwork to SOS Internship Coordinator (at least 2 weeks prior to start of semester). Register for SOS 484 course upon clearance from Internship Coordinator. Begin internship and start SOS 484 coursework (first week of ASU term—fall, spring, or summer). It’s also possible to create your own internship by contacting employers in your field of interest and describing your qualifications, interests and how you can contribute to their success. Descriptions of existing internships are helpful to frame your discussion with a possible internship host. Focus on the advantages to the organization in hiring an intern, such as having an extra person to assist with projects, offer new perspectives on organizational issues and provide new ideas. While you cannot get internship credit for a current job that you hold, there may be opportunities to work within the same company, as long as the experience you will undertake is a NEW one for you and directly related to sustainability. Finding an internship requires preparation and commitment, so if you would like to complete one or are required to for your capstone, plan to begin your search 2-4 months in advance. The Internship & Experiential Education Specialist is available as a resource for you throughout the entire internship process. Becoming Internship Ready workshop, coming soon!